I thought my heart would break as a read through the treaties in a large volume dated in 1825 during my visit to Chicago’s Newberry Library last week. The volume contains page after page of US-Indian treaties. John Quincy Adams was president, soon to be beaten in his 1828 re-election bid by Andrew Jackson, who would later defy the Supreme Court and set in motion the forced removal of the Cherokee from New Echota. 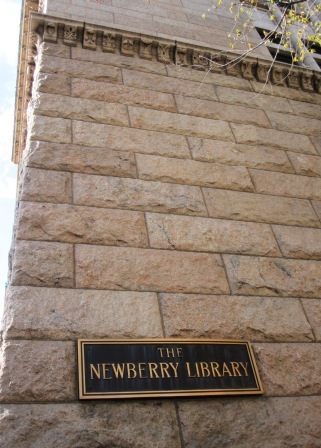 Purpose of my visit to the Newberry was to research in person the vast collection of Indian books and artifacts. I reckon I could spend a full year just reading the materials, but had to limit my visit to 3 days. I spent hours combing through newspapers, looking for descriptions that would help me understand how Indian ways-of-knowing were framed. In a collection by anthropologist Robert Helzer of news articles from 1851-1866, I discovered that Indians were typically characterized as dirty, lazy and indolent. A recurring theme is the lack of a “useful” and “industrial” relationship with the land, which, it turns out, was a lie woven into the removal narratives. This entry was posted in framing, Indian, journalism and tagged stereotypes. Bookmark the permalink.